This is the second installment of the Bypass Valve posts. Sometimes with a tuned vahicle we want to eliminate some of the compromises the facory made. In this case it was noise related to the turbo bypass valve (BPV) “hooting” during light acceleration when the manifold vacuum is too low to keep the valve in steady state causing it to osscilate. The factory got around it by fitting an electronic valve that connects the BPV to either before or after the throttle. Tuned we want to simplify this. For years we have been doing this to the cars here and figured it time to share with a nice HowTo.. Bigger Image Opens in new window. Basically we want to cap the throttle port and fit a new hose (shown Green) directly from the bypass valve to the manifold. Deleting the red and orange hoses and the valve. Leave the valve electrically plugged in. Should be a 10min job only a 4mm or 3/16″ vacuum cap and a few feet of 4mm hose. This entry was posted on Wednesday, November 18th, 2009 at 4.44 pm and is filed under (Nicks) Viggen, HowTo, Powertrain. You can follow any responses to this entry through the RSS 2.0 feed. You can leave a response, or trackback from your own site. Boost gauge must see manifold pressure/ vacuum to give you good data. T into the Bypass valve is the best idea. You do not want to T into the MAP sensor or fuel regulator hoses. A failure of either of these signals will lead to engine damage at full boost. Then it would probably be best to leave it to a professional. Quick question on this, what is the benefit of changing the route? What does it accomplish? Maybe I’m just being obtuse. I have a forge diverter valve with the stock spring it in btw. If I made this change, would there be any difference in the car? I just did the BOV swap,it easy then wut I think in the first begining. The boost spoon up faster then before. I’ll try to install the open intake tmr. Certainly no reason it would cause issues. Hi Nick, big fan here, luv the blog which i recently discovered. I know you advise going with the softer spring in the dump/recirculate valve; I have a question about it. Since i did the T7 vac line mod on my 2001 viggen, when I’m on 2nd gear, after a little bit of boost, the valve opens and dumps/recirculates (using a forge bpv with green spring). should I run a different spring? It’s good to mention that I’ve also put the 3″ down pipe with straight through catbak at the same time i did the vac line mod. Basically with te other mods it is making the target airmass easier than before so there is extra and the throttle is closing to regulate airmass. This is why matched tuning software is important. I would leave it like that. In this situation it just makes more thermal load with the wasted boost. Thank you for the reply Nick! much appreciated. Sometime in the near future I will contact GenuineSaab to discuss what stage of Nordic is suitable to the mods that I have. What about the Yellow hose?…you say delete the red and orange lines but you mention nothing about the yellow.where does the yellow hose go to? 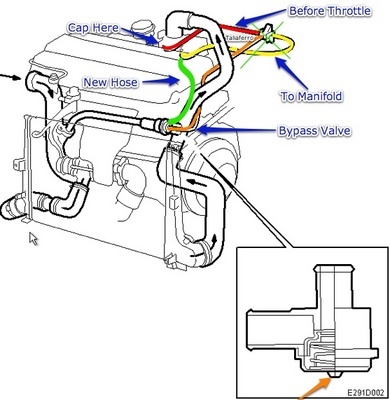 All you are doing is capping the (now) unused throttle body port and running a hose straight from the manifold connector (This one went to the valve) to the bypass valve. Ignore the valve on the firewall. Thats all. Don’t make it more complicated than it actually is. So like you said, after doing this mod my BPV started honking at low vacuum. Will a Forge BPV still oscillate at low vacuum? Throttle response is MUCH better now. WOW!! Saw this mod a while back, just recently installed a boost gauge in my 01 9-3 base and gave this a go.. and.. VERY RESPONSIVE!! MPGS have gone down a bit, but I just reset the ECU and enjoying it ty !!! Do you have any performance mods installed? I ran this mod for a couple of days and didn’t really notice any difference in throttle response. However, I have noticed a decrease in MPG’s also. I’m just curious b/c I have an 01 9-3 Base also. Just did this mod and it really was pretty simple. Was confused for a bit as to what to do with the t-valve coming off the solenoid. Just teed into the line from the BPV to the manifold. Boost definitely spools up faster. Other than booster seats in the back i haven’t done anything to 2008 9.5 YET! Tracing a p0101 code, when i get that sorted will get on the throttle and see what i see! Thanks Nick! Just done this mod. It’s very very simple to do. I also did the bolt mod on the evap system. Will let you all know later how it performs on my 2000 9-5 Aero stage 3. Do i need a T-pipe to connect Yellow and green?? Do I need to cap the valve will not have a hose? What about the yellow hose? Delete all hoses, and install ONE new (Green on pic) ? Then cap before trottel? Cap the valve that have some hoses missing?